on waterfronts as well as indoor and outdoor pools. Used with 3/4" rope. The Resue Timmy was developed to simulate a 3 year old patient for handling, transportation, and extrication training. This manikin can be safely used in situations too hazardous or uncomfortable for human volunteers. Made of durable vinyl with 4,100-lb. test plastic-coated cables, features include articulated joints, and weight distribution according to human weight distribution charts. The Laerdal premium strap with speed clip ends has been designed to be use with BaXstrap� Spineboard. 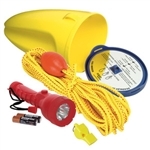 Complies with Coast Guard Safety Equipment Requirements! Fits Perfectly into a bailer capped with mirrored lid. Innovative design makes bailer easy to grab in an emergency. Finally a rescue tube that can take some abuse! This is the only rescue tube on the market that is made of molded EVA foam, making it resistant and very comfortable due to it�s rounded edges. Our 40� rescue tube features reinforced ends, polypropylene cord, a 2� shoulder strap equipped with a stainless steel snap hook, stainless steel O-rings, and LIFEGUARD logo embossed in the foam on one side. Its vibrant yellow colour makes it very visible. The measurement of this rescue tube meets NLS requirements. The molded rescue tube can be use at water parks, lakes, ocean front or around the pool. CW part numbers 903092 AND 983060. Introducing the SpeedBlocks Head Immobilizer. Designed for durability and performance, but priced for disposability, SpeedBlocks really gives you the best of both worlds. SpeedBlocks offer a simple, four-step process for application, a unique, multi-axis blocks system to accommodate all head shapes and injury positions and direct access to patient�s ears for better communication and inspection. The low-cost blocks with disposable foam pads and head straps are so effective that the inconvenience of taping the patient can be eliminated. � Latex-free. The first Image consists of part numbers 903092 (Speed Block Set) and 983060 (Speed Blocks Universal Base). Family of 5, 10 and 20 lb. bricks for instruction, training and competition. All three feature the new easy-grip contour; easy to pick up, easy to hold, easy to stack. Soft rubber casing is also easy on pool inner linings. Available in a 3-brick pack (1 brick of each weight) or separately: 5 lb. (2.25 kg), 10 lb. (4.5 kg) and 20 lb. (9 kg). As a rescuer you want your spineboard to be comfortable for our patient, rigid and lightweight. Further you also want to store the board easily. The BaXstrap Spineboard provides this and is one of the lightest boards on the market. The contoured design allows the board to nest compactly. This unique feature also offers patients more comfort, making it less likely that they would move around and aggravate their injuries. Copyright © 2014 Royal Life Saving Society Canada, Alberta and Northwest Territories Branch. All Rights Reserved. Online Store by Volusion.